Caldarelli, G.; Pastor-Satorras, R.; Vespignani, A. We study the properties of quantities aimed at the characterization of grid-like ordering in complex networks. These quantities are based on the global and local behavior of cycles of order four, which are the minimal structures able to identify rectangular clustering. The analysis of data from real networks reveals the ubiquitous presence of a statistically high level of grid-like ordering that is non-trivially correlated with the local degree properties. These observations provide new insights on the hierarchical structure of complex networks. Caldarelli, G., Pastor-Satorras, R., Vespignani, A. 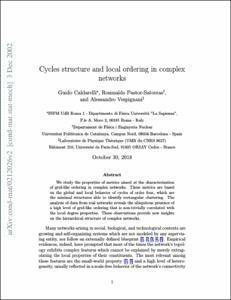 Structure of cycles and local ordering in complex networks. "European physical journal B", 1 Març 2004, vol. 38, núm. 2, p. 183-186.